Space junk is something that most of us don’t normally encounter (because we’re stuck here on Earth and all that). But astronauts and those involved with space exploration think about it quite often. From old satellites to bits of meteoroids, there’s tons of debris traveling in orbit around the Earth. There’s certainly a lot of space in outer space. You might be surprised just how much space junk is floating around out there and how much it can get in the way of space vehicles and astronauts. NASA estimates there are more than 500,000 pieces — or 3,000 tons — of man-made space junk the size of a marble or larger floating in orbit around Earth. 20,000 pieces of orbital debris are larger than a softball. Space junk travels at 17,500 miles per hour — which means it can cause severe damage to anything it hits. NASA tracks the larger pieces of space junk, but can’t monitor the millions of tiny bits of space junk in orbit. 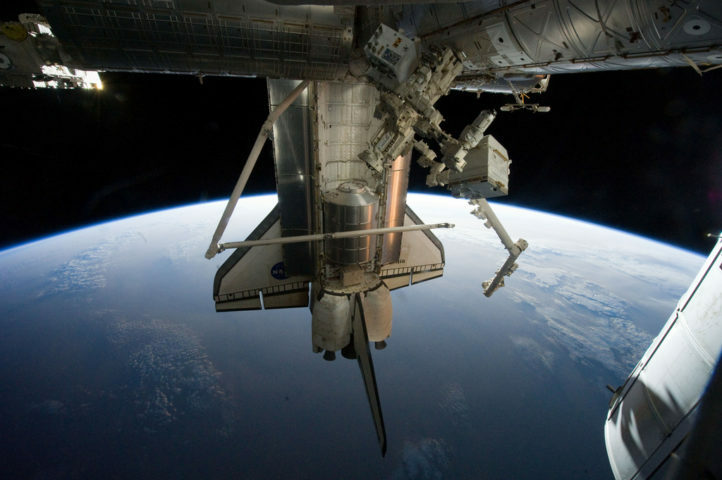 Even tiny flecks of old paint from space equipment have caused severe damage — requiring windows to be replaced on the space shuttle. The video above approximates just how much orbital debris has accumulated since Russia launched a tiny satellite known as Sputnik in 1957. In the 1960s, as the Space Race heated up, the amount of orbital debris increased from dozens of trackable pieces to hundreds and eventually thousands. In 1981, when NASA’s space shuttle program launched, the amount of debris floating around in orbit quite literally skyrocketed. As we’ve sent more and more satellites, vehicles, and other equipment into space, the amount of orbital junk floating around has inevitably increased. Indeed, there have been a few incidents involving space debris. One of the most notable is a 1996 space accident in which a French satellite collided with debris from a French rocket that had exploded some 10 years before. Still, there have been remarkably very few crashes with these floating bits of orbital flotsam and jetsam. What Else Causes Space Debris? While bits and parts of satellites, bits of paint from space vehicles, and other incidental garbage has been cast off from the thousands of things we’ve launched into the heavens, space missions aren’t the only thing that have caused the increase in orbital debris over the decades. For example, a Chinese anti-satellite test in 2007 blew up an old weather satellite, causing it to blister into more than 3,000 pieces of trackable space debris. In 2009, an old Russian satellite crashed into a functioning U.S. satellite, and the space accident caused both pieces of equipment to shatter into more than 2,000 trackable pieces of space junk. Can You See Space Junk From Earth? Yes! And what a dazzling display this orbital debris can cause when we do see it. Even tiny bits of satellite parts will put on an incredibly, flaming appearance in the sky when it burns up as it reenters Earth’s atmosphere. For example, the reentry of an Russian rocket body looked like a flaming ball of fire in the night sky over California and Nevada in 2015. Can We Remove Space Junk? A solution for cleaning up space junk is something that scientists have been working on for a long time. A team of astronomers in Japan think they have the perfect plan: a laser cannon. That’s right — they propose to zap space debris to smithereens with lasers. They think the plan will work, but there’s just one teensy, tiny problem: politics. What if a laser accidentally zaps a military satellite? It could possibly lead to war between nations. What if a communications satellite is damaged? Perhaps no more satellite TV or Internet for some people — at least for a little while anyway. The goal would be to strap the space junk laser cannon to the International Space Station, a theoretically neutral orbital territory that could most benefit from such a laser zapper. Other ideas for removing space junk include tethers, sails, puffs of air that safely blow debris out of orbit and into the Earth’s atmosphere (where the space schmutz burns up), and even a device called a Swiss Maid that will capture a tiny satellite called a Swiss Cube.